[Adam Zeloof] (legally) obtained a retired electric scooter and documented how it worked and how he got it working again. The scooter had a past life as a pay-to-ride electric vehicle and “$1 TO START” is still visible on the grip tape. It could be paid for and unlocked with a smartphone app, but [Adam] wasn’t interested in doing that just to ride his new scooter. His report includes lots of teardown photos, as well as a rundown of how the whole thing works. Most of the important parts are in the steering column and handlebars. These house the battery, electronic speed controller (ESC), and charging circuitry. The green box attached to the front houses a board that [Adam] determined runs Android and is responsible for network connectivity over the cellular network. To get the scooter running again, [Adam] and his brother [Sam] considered reverse-engineering the communications between the network box and the scooter’s controller, but in the end opted to simply replace the necessary parts with ones under their direct control. One ESC, charger, and cheap battery monitor later the scooter had all it needed to ride again. With parts for a wide variety of electric scooters readily available online, there was really no need to reverse-engineer anything. Ridesharing scooter startups are busy working out engineering and security questions like how best to turn electric scooters into a) IoT-connected devices, and b) a viable business plan. Hardware gets revised, and as [Adam] shows, retired units can be pressed into private service with just a little work. The motors in these things are housed within the wheels, and have frankly outstanding price-to-torque ratios. We’ve seen them mated to open-source controllers and explored for use in robotics. It’s not that [GreatScott!] isn’t aware that 3D-printed motors are a thing; after all, the video below mentions the giant Halbach array motor we featured some time ago. But part of advancing the state of the art is to replicate someone else’s results, so that’s essentially what [Scott!] attempted to do here. It also builds on his recent experiments with rewinding commercial BLDCs to turn them into generators. His first step is to recreate the stator of his motor as a printable part. It’s easy enough to recreate the stator’s shape, and even to print it using Proto-pasta iron-infused PLA filament. But that doesn’t come close to replicating the magnetic properties of a proper stator laminated from stamped iron pieces. Motors using the printed stators worked, but they were very low torque, refusing to turn with even minimal loading. There were thermal issues, too, which might have been mitigated by a fan. [Tom Stanton] is scratching his creative itch with this radio-controlled tilt-rotor airplane that presents some unique problems and opportunities. Tilt-rotor planes are, as the name implies, able to swivel their propellors and transition them from providing forward thrust to providing verticle lift. With the rotors providing lift, the aircraft is able to hover and perform vertical take-off and landing (VTOL); switched to thrust mode, wings provide the lift for horizontal flight. [Tom]’s realization of this design seems simple – a spar running through the wing holding BLDC motors and props is swiveled through 90° by a servo to transition the aircraft. Standard control surfaces on the wings and tail take care of horizontal flight. Actually getting an off-the-shelf flight controller to deal with the transitions was tricky. [Tom] ended up adding an Arduino to intercept the PWM signals the flight controller normally sends directly to the servos and speed controls to provide the coordination needed for a smooth transition. Full details in the video below, and some test flights which show that an RC VTOL is anything but a beginner’s plane. [Tom] is proving himself to be quite the Renaissance man these days. Between air-powered piston engines, over-balance trebuchets, and popping the perfect wheelie, he seems to have covered all the bases and done his best to keep our tip line stocked. 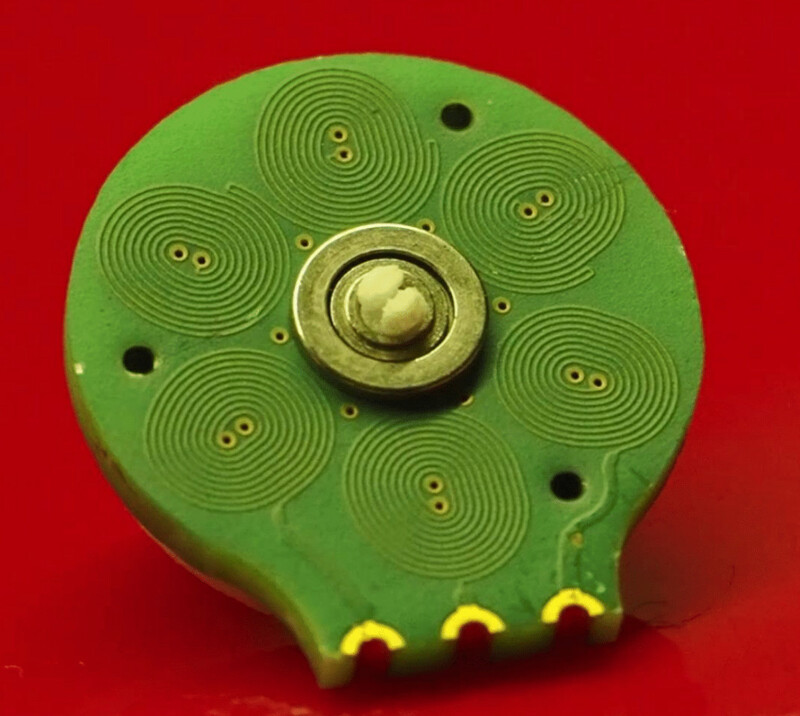 One of the more interesting hacks we’ve seen this year is [Carl]’s experimentations with making motors out of PCBs. Honestly, it’s surprising no one has done this before — a brushless motor is just some coils of wire and a few magnets; anyone can turn some coils into traces and make a 3D print that will hold a few magnets. This latest advancement is something else entirely. It’s a motor and an electronic speed controller all in one. This project is a continuation of [Carl]’s PCB motor project, which started with him routing coils for a brushless motor as traces in a circuit board. Previously, we’ve seen [Carl]’s motor spinning on its own with the help of a small hobby ESC / motor controller meant for model planes and drones. This time, we’ve got something different. It’s an entire controller and motor, integrated into one single PCB. This is a very, very small motor and ESC combo. The motor driver is a 3x3mm QFN package, and most of the other components are 0201. The main parts are a very tiny triple half-bridge motor driver and a PIC16F microcontroller. This PIC reads a hall sensor to detect the speed of the motor, and with just three pins — power, ground, and a PWM pin — this motor can spin at a set speed. The future goals of this project are to make it work just like any other hobby ESC — just plug it into a servo controller and let ‘er rip. Since this motor with an integrated PCB requires only three connections, we’re looking at a great tool to add motion and rotation to any project. It’s fantastic, and we can’t wait to see something like this in robots, toys, and other home goods.